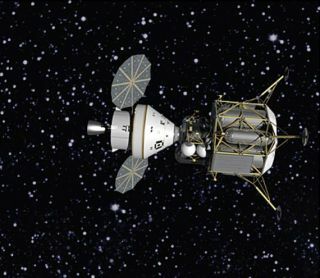 An artist's depiction of NASA's new Orion spacecraft and docked Altair lunar lander in transit to the moon. NASA hopes to renew manned moon missions by 2020. CAPECANAVERAL, Fla. — When astronauts return to the moon by 2020, they will do sofollowing a familiar path and flying in a cone-shaped capsule that echoes the?good old days? of Project Apollo. But theskin-deep similarities between Apollo?s Command Module and Constellation?sOrion spacecraft are far outnumbered by differences - more likeimprovements — that NASA?s 50 years of spaceflight experience make possible. ?We?velearned a lot, but we still have a lot of questions,? said Bret Drake, ChiefArchitect in the System Engineering and Integration Office for Constellation atthe Johnson Space Center in Houston. Forexample, the best Apollo could offer by 1972?s final lunar excursion was atwo-man crew lingering for about three days at a landing site that wasgenerally near the moon?s equator. Constellationis shooting for a means to land anywhere on the moon and eventually grow thecapability to build up a permanent presence at one site, likely near one of thepoles, Drake said. ?We?retrying to evolve a capability, right out of the box, where we?re going to havefour-member crews staying on the surface for seven days,? Drake said. ?Buteventually we?ll get to the point where we have four crewmembers on the surfacefor 180 days.? Thatpotential still is more than a decade away, and though the fine details of whatall the hardware is going to look like continue to evolve, the picture of howthe United States will goback to the moon is coming into focus. "Functionally,physics drives you in a lot of the same directions we went through inApollo," Drake said. ?We?re doing a lot more with the systems than we werewith Apollo.? To start,that means the Orion spacecraft will be shaped like a cone, Drake said. Whendetermining the best shape to deal with the speeds and heat of reentryencountered by a spacecraft returning from the moon, the laws of physics arethe same in the 21st Century as they were in the 20th Century. So from adistance the Orion spacecraft looks almost identical to the ApolloCommand Module. Up close the differences become more apparent, especiallythe size. Orion isnow set to be 16.5 feet (5 meters) in diameter and 10.8 feet (3.3 meters). Itwill weigh about 31,000 pounds (14,000 kg) empty and have a habitable volume of692 cubic feet (11 cubic meters). Apollo?sCommand Module by comparison: A diameter of 12.8 feet (3.9 meters) and a heightof 11.4 feet (3.47 meters). Total dry weight was 12,787 pounds (5,800 kg) andits crew cabin volume was 218 cubic feet (6.17 cubic meters). Bothspacecraft had or will have an attached Service Module that will have a singlelarge engine fed by storable propellants and contain storage and bays tosupport the main cabin systems. Both Apolloand Orion?s Service Module will have batteries and electricity generating fuelcells, but the Orion also has a pair of solar arrays to help keep the vehiclepowered during its intended long stay in lunar orbit. And thatbrings to light some of the key difference between the Apollo and Orion missionscenarios, or more simply, the paths they will follow from the Earth to the Moon. DuringApollo, a single three-stage Saturn V Moon rocket carried the crew, CommandService Module and the Lunar Module into Earth orbit. After one orbit theSaturn V?s third stage was re-ignited and sent Apollo toward the Moon. Afterdiscarding the third stage on the way to the Moon, the Apollo spacecraftentered lunar orbit. At the appropriate time, two of the three crewmen boardedthe Lunar Module and went down to the surface, leaving the third crewman in theCommand Module. The planfor Constellation, as it stands now, is to launch a four-person crew in anOrion spacecraft atop an Ares I launch vehicle from the Kennedy Space Centerinto Earth orbit, where it will wait up to four days, Drake said. Ninetyminutes after the Ares I launch, a heavy-liftAres V rocket is to launch the Altair lunar landing spacecraft and an EarthDeparture Stage into Earth orbit for a same day rendezvous and docking with theOrion capsule. The joinedspacecraft will remain in Earth orbit for up to four days while waiting for theMoon to orbit into the right position when the launch window for a Trans-LunarInjection opens up. Then the combined spacecraft will blast their way towardthe Moon. Afterdiscarding the Earth Departure Stage, the Altair lunar lander?s rocket engine —powered by liquid hydrogen and liquid oxygen — will brake the spacecraft intoorbit around the moon. This isdifferent from Apollo, which relied on the Service Module?s main servicepropulsion system engine for the same job. Althoughplans for the first mission or so may change, Drake said the baseline plan isfor all four astronauts to board Altair for the trip to the lunar surface,leaving an empty Orion spacecraft to circle the moon on its own. That?s abig difference from Apollo, which left one astronaut in the Command Module tokeep that spacecraft healthy and the crewmember busy with ?bird?s eye? scienceobservations of the surface. As for theselection of a lunar landing site, during Apollo a variety of sites wereexplored, all generally near the moon?s equator. For Constellation, a singlesite will be selected, likely near one of the poles. With each landing NASA will leave equipment there that can be joined with other hardware to build up a permanent station on the surface. It may be possible to establish this site in a place on the Moon where there is always sunlight, which can help with generating electricity and maintaining the correct thermal conditions with the surface hardware. It is also possible that a crater near the poles that remains in constant darkness may hide water ice, which can be broken down into hydrogen and oxygen for use in powering fuel cells, producing rocket propellant and making drinking water. Systemsinside Apollo versus Orion also will be very different. WhileApollo had a switch for everything, Orion will have glass cockpit displays andtouch-sensitive screens that can be programmed on the fly. WhileApollo relied on computers with less power and memory than a digital toy foundinside a cereal box, Orion will have the latest computers plugged into an openarchitecture that allows upgrades to software and hardware. WhileApollo used a pure oxygen atmosphere in space, Orion will use a nitrogen-oxygenmixture at reduced pressure to make it easier for spacewalking or Moonwalkingastronauts to depart the spacecraft. And whileOrion?s heat shield will use an ablative material and parachutes for asplashdown in the water like Apollo, unlike Apollo there continues to be talkabout how much of an Orion spacecraft can be reused after flying, Drake said. ?We have alot of options on the table,? Drake said of the entire Orion system. Jim Banke is a veteran aerospace commentatorand consultant based in Cape Canaveral, Fla.